Like most of us, I suspect, I upload to Amazon my Word Doc whenever I have a new book or wish to make changes to a previously published one. However, there is a way that gives you far better control over the finished product, while being user-friendly enough for most of us: Kindle Create lets you format your manuscript using an intuitive environment with a built-in previewer and all the tools you are most likely to need. The intent of this program seems to be to simplify the publishing process for novice authors. Instead of uploading a Word file and then having to download the result of conversion for testing, Kindle Create handles conversion, previewing, and simple formatting all in one app. When you select a paragraph, you can apply a number of ready-made templates on it, called Elements. These include the book title, subtitle, author name etc. A similar set of Elements exists for the book body, and the book start and end pages. Even better, you can format individual chunks of text and insert images, page breaks, and entire new chapters. In short, it’s a breeze to use. Furthermore, you can preview how your book will look when using the new enhanced typesetting and the Page Flip engine on Kindle e-readers and Kindle apps. The only bug I’ve noticed concerns tabs. Word has the annoying tendency of not always formatting these as it should. You can manually enter a number to indicate how far indented you’d like your tab in Kindle Create but there seems to be little correlation between the actual number and the indentation: 1.85 can result in a greater indent than, say, 3. Which means you may have to experiment a bit and, perhaps, even manually change all tabs in the document to ensure perfect indentation and consistency throughout your manuscript. So, when you export, you will see a KPF (Kindle Package Format) file which is, in truth, a zipped archive of the book folder. There are no further export options, which could be a problem if you want to publish the same book as an EPUB (of course, Amazon probably considers this to be a positive.) You can preview the KPF file using Kindle Previewer or upload it to KDP. As Howell explains, looking behind the scenes at how the program works may provide some information on the direction Amazon is going with the Kindle platform. Internally, the program uses the KPF file format, which is KFX data stored in a SQL database. The Word file is converted to KFX on import. Much of the conversion and previewing code seem to be borrowed from Kindle Previewer 3. Changes are made using a new KFX editor with limited functionality. Since the file sent to Amazon when the book is published is basically KFX, Amazon must be deriving the MOBI and KF8 formats from KFX at their end. This is the reverse of how things have worked up to now. People seem to be of two minds about all this. One side feels that anything that locks newcomers into a closed system (Kindle Unlimited, Kindle Select, the various fixed-format templates, and now Kindle Create) is bad for them and ultimately for everyone. The other side welcomes the ease of use provided by Kindle Create and argues it’s perfect for novices who just wish to publish a book, not fiddle through countless settings. Regardless of your thoughts on this, what do you do if you wish to convert your KPF file to another format if you want to send a copy to a friend to review? Thankfully, Calibre has a free KPF-conversion plugin, written by John Howell. You can install it through Calibre itself, so there’s no need for you to download anything. Just select it from the list of available plugins, install, and restart Calibre. Is the end result perfect? No. Amazon formats are nor documented, so John has had to reverse-engineer the file to create his plugin. But it is as close to a perfect solution as you can find out there. Which is not surprising, given that it’s the only solution out there! Kindle Create supports eBooks in Dutch, English, French, German, Gujarati, Hindi, Italian, Malayalam, Marathi, Portuguese, Spanish, and Tamil. Use this link to take Kindle Create out for a spin! Great info on a new ‘toy’. Thanks for sharing! Your blogs are always informative and helpful. Thanks for the good, bad and the ugly (love it). I tried Kindle Create last April and found it awkward to use. Because I use a Mac I think I had a beta version. Hopefully, they have refined it some. 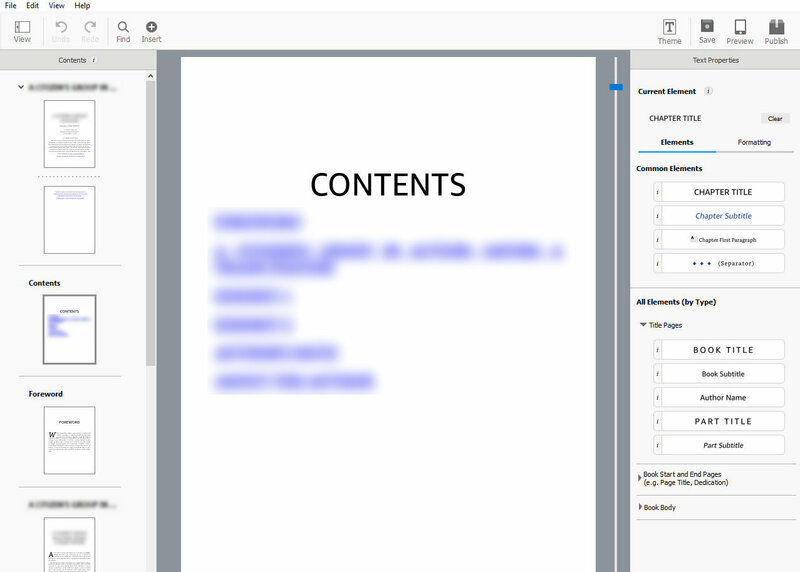 I ended up do my stylist formatting in Word and then converting the document to pdf before uploading. I will give it another try. Thank you. You’re right: the beta version was rather clunky and didn’t have half the features! I haven’t used the Mac version, though, so I’d be curious to hear how you fare with it! Great post, Nicholas. I’ve only used Kindle Create on textbooks which use PDF not .doc or docx. Bookmarked for future reference. How does Kindle Create work with PDFs? I haven’t tried it out yet, although I will in the near future. The Kindle Create for textbooks basically uses ‘fixed format’ that it takes from the PDF – i.e. each page of the PDF is one page of the textbook. Using it is very easy but preparing the PDF beforehand is not. Ah, that makes perfect sense. Thank you! lol – Coals to Newcastle, but I totally agree re Chris. I’ve learned so much from him.